A time-lapse image of the dust storm's progress from the Opportunity rover, from June 14, 2007 through July 19, 2007. The images are approximately true color composites, generated using data from the rover's panoramic camera's various filters. 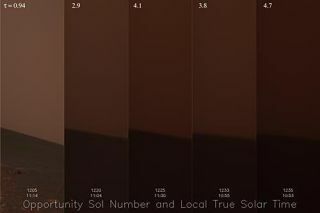 The numbers across the top of the image report a measurement of atmospheric opacity, called "tau." The lower the number, the clearer the sky. Mars' globe-engulfingdust storm has died down during the past several weeks, but the two roboticrovers on its surface now face the fallout of dust from the thin atmosphere. Conditionswere so bad in early August that just before the launch of the Mars-bound Phoenix spacecraft, rover scientist Mark Lemmon fearedthe demise of the Opportunity rover. "Therewas one sol [Martian day] when there was real uncertainty we'd hear fromOpportunity," said Lemmon, a planetary scientist at Texas A&M University. He added that the plucky robotic explorer almost entered a power-savingmode that would have been dangerous "uncharted territory" for therover team. Still,Lemmon thinks the Mars rovers will persevere through the dustyconditions. "Marscould throw worse storms at us, but for this season I think we have seen theworst," he told SPACE.com in an e-mail. "We got a gooddemonstration that Mars could kill them." Thin layersof reddish powder have been accumulating on Spirit and Opportunity's solarpanels due to fallout, blocking light at levels comparable to conditions duringthe worst periods of the storm, Lemmon said. Scientistsuse the measure "tau" to describe the lightblockage, where zero is perfectly clear and light blockage diminishes asthe figure increases. Tau grew to greater than 5 during the peak of the duststorm. "Unlesstau goes to 5 for several sols in a row, it looks like she's out of thewoods," Lemmon said of the Opportunity rover, which has born the brunt ofthe dusty assault. Tau is currently around 3.3, he added. Stifledlight can threaten the Mars rovers because their electronics need to stay above-40 degrees Fahrenheit (-40 degrees Celsius)?below that and metal circuits canshrink, snap and claim the rovers' lives. On themartian surface, temperatures are a bone-chilling average of about -81 degreesFahrenheit (-63 degrees Celsius). To combatthe cold, the rovers rely on small internal radioactive heaters to stay warmand regularly go into "sleep" mode to conserve energy. Lemmonreported that both robots now gather above 240 watt-hours per sol, enough topower a 120-watt light bulb for two hours. He said at least 160 watt-hours per solis required to keep the electronics alive and well. "Spirit's panels are still cleaner than before thestorm, Opportunity's panels are dustier," Lemmon said. He added thatmission managers are thinking of ways to minimize accumulating dust, such astilting the solar panels, but most options seem more risky than simply toughingit out. "Once the dust settles, we can pray for wind," hesaid. "Not too much, just enough to clean the panels." Lemmon saidthe rovers' journey has been anamazing one, especially because they were expected to survive for only threemonths after landing. They have explored the surface of Mars now for nearly threeyears and seven months. "Iknow we're all as stunned as anyone when we look back on how much the rovershave been able to do for us," Lemmon said. As of sol1,282, or August 13, 2007, Spirit surpassed the nuclear-power Viking Lander 2'srecord and is now the second-oldest operational robot on Mars. "Asolar-powered vehicle is now in second place ahead of one of the nukes, despitethese dust storms," Lemmon noted, referring to the nuclear-powered Vikinglanders. Spirit and Opportunity technically are solar-powered, although they dohave the radioactive heaters. While itmay take another grueling 959 sols (which will occur in April 2010 on Earth)for Spirit to surpass the first Viking lander's operational record, Lemmon saidthe rover team isn't planning on closing shop anytime soon. "[Programmers]apparently developed a 2010 patch for a small rover flight softwareglitch," Lemmon said. "Just in case."